So today, Ben and I are at the library. We go there all the time, and we never have a problem. Ben starts fussing, whining, obviously wanting up. 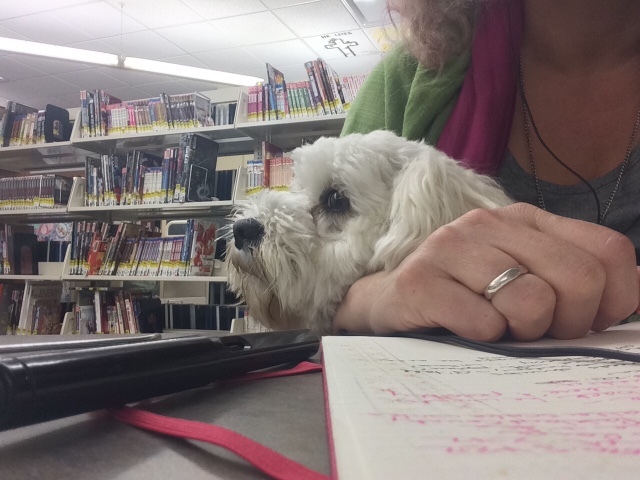 Service dogs have to stay on the floor unless they are working… But, it’s the library, I don’t think anybody’s going to mind, so I pick Ben up. Five minutes later, as Ben exhales in vast relief, I realize that my body has relaxed, and I am unwinding. You know, I have always assumed that when he fusses at me when he is working that he is scared or upset. Which, to be honest, sometimes he is.